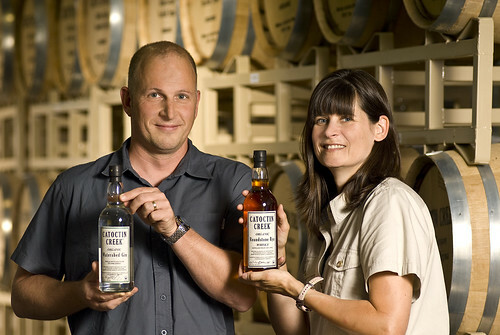 Scott and Becky Harris, Co-owners of Catoctin Creek Distillery. 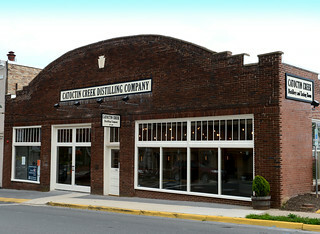 Photo provided by Catoctin Creek. When I travel, Iâ€™ll go to some place like Berlin, or London, or Singapore, and see a bottle of my stuff on the shelf of a restaurant that I visit, and that is amazing, itâ€™s just unbelievable. Itâ€™s super rewarding to see that. “I gave up my job to make whiskey, not bottle whiskey.” When the topic of a Catoctin Creek Distillery tour I attended turned to the recent stories detailing how many “craft” whiskeys actually come from the same factory distillery in the midwest, Scott Harris of Catoctin Creek DistilleryÂ assured guests that he and his wife Becky did not give up their software and chemical engineering careers to simply bottle whiskey. 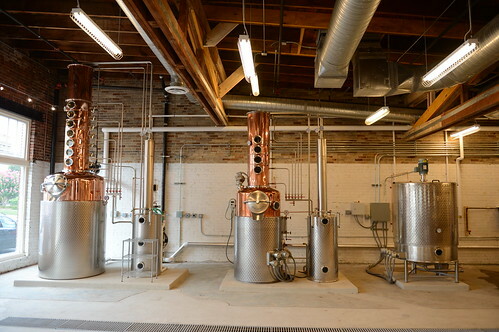 The tour, which explained each step of the distilling process by detailing the function of each piece of equipment,Â provided additional confirmation. Though Scott and Becky want you to know they don’t just bottle whiskey, they love getting guests involved in the bottling process. Their bottling workshops started out of necessity, as in the early days of the company, Scott and Becky needed all the help they could get to ship orders out on time. They now have upgraded equipment that allows them to bottle products more efficiently, but still host regular bottling workshops as a fun way to get the community involved (the next workshop is on November 7).Â After a bottling workshop in September, I had the pleasure of speaking with Scott and Becky to discuss everythingÂ from collaborations to jingles. PP: Describe a typical day at the distillery. Scott Harris: Iâ€™m the General Manager, and so I typically do business work. Most of my days, if I am here, Iâ€™m going to be in the back, looking at bookkeeping, sales reports, and marketing, and things like that. Iâ€™m kind of the office job guy, or if Iâ€™m not here, then Iâ€™m out meeting people. I was recently in North Carolina, going to restaurants and to liquor boards, trying to open up some avenues for sales in the markets that we are in. Thatâ€™s kind of my job-sales and bookkeeping and general management-keeping an eye on the numbers and making sure we are paying the bills. Becky Harris: My typically day starts about six in the morning. We come over and start the mash process, and that will go until about noon to 1 oâ€™clock depending on the time of year. Weâ€™ll also start the big still, and if weâ€™re running gin or brandy, weâ€™ll start the little still as well. Both stills will start up, and the small still usually finishes about noon-1 oâ€™clock, and the big one could be around 2:30-3:00. We clean up, get empty barrels, prepare stuff for bottling, review current orders, pack stuff up to ship it out. It is a pretty busy day. Every so often we will do barrel tastings, which is a fun day, everybody likes that day. Scott: After the work day is done, not every day, but often, our second shift is when we go downtown and we have to do events. We might go down to Jack Rose or Southern Efficiency in DC, where we are doing a Meet the Maker event, and that can often takes us until midnight, and then we get up the next morning and start all over again. Itâ€™s a busy, busy, life. 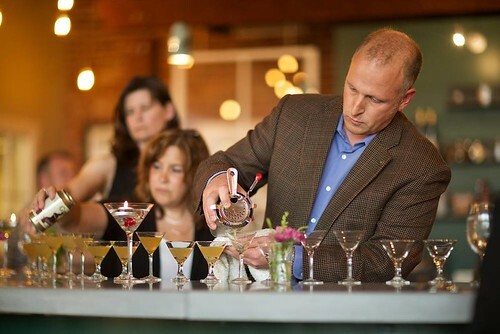 Photo provided by Catoctin Creek. PP:Â Describe the most challenging day on the job. Becky: Ones where we have a big mess. Thatâ€™s generally when somebody doesnâ€™t pay attention. Scott: In other words, when I make a mistake. Becky: Someone might have forgotten to close the tank before they started putting something in, and that can be a real mess. Itâ€™s a lot of fun to clean up. Scott: One time we were filling the fermenters with the mash, and if the little valves on the bottom arenâ€™t closed, if you pour it in, it just pours right back out on the floor. Becky: That was the day I was gone. Scott: Itâ€™s a very sticky, syrupy mash, and once it gets all over the floor, you kind of look at it, and go, â€œAh, crap,â€ because you know the next four hours are going to be spent cleaning it all up, so that can be a real pain. PP:Â What is the most rewarding part of your job? He says, ‘I want to work with you guys for the next 20 years, and so the wine is free,’ and I thought, wow, this is great, we are getting into a really awesome industry with some really awesome people and that collaboration is what we enjoy so much. Scott: There are a bunch that are surprising to win. We enter the contests ahead of time hoping to get good medals and stuff, and some of the gold medals that we have won in San Francisco, London and New York are really great recognition, but the most surprising and unexpected was when Becky won an award from Women Chefs and Restaurateurs. That was up in New York City, and we were asked to go, so we went up there. It was honoring different people in the industry who have been foundational, and they gave Becky the Golden Goblet Award for her work in advancing women in this business of distilling. I thought that was so wonderful. PP:Â What is the most interesting thing youâ€™ve learned about whisky or distilling since you started? Becky: (laughing) How incredibly lucrative it is. No, thatâ€™s not what we learned. Scott: How hard it is. Itâ€™s a very, very hard job. Becky: Itâ€™s the hardest. Iâ€™ve talked to many people. Iâ€™ve talked to a guy locally who has started a brewery, winery and a cidery, and heâ€™s now starting a distillery. He said this is the hardest one of all of them. That’s how hard it is to make it work. Scott: Sometimes we think, Â if we had known going into it what we know now, would we have done it? I donâ€™t know. Itâ€™s awfully hard. Becky: Itâ€™s tough. Itâ€™s amazingly fun and really rewarding, but it is really hard. Scott: Yeah, so that was kind of something that we didnâ€™t really know going into it. But I mean, would we do it all over again? Yeah, we would. Itâ€™s been so rewarding, we really enjoy it. 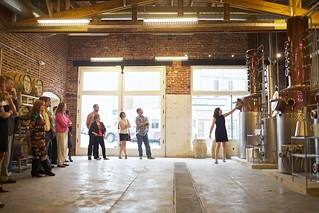 Becky giving a tour of the distillery. Photo by Catoctin Creek. PP: I see that you have your sons helping you out today. Are they interested in working in this business? Becky: They are kind of at that age where what Mom and Dad do isnâ€™t the most amazing thing in the world. Plus they see how hard it is, so it isnâ€™t necessarily at the top of their dream list. If they decide to join us at one point, thatâ€™s great, but if not, thatâ€™s great too. I want them to be able to do what they want to do. Scott: Divorcing myself from the business, as a parent, you donâ€™t necessarily want to saddle your children with your dreams. I want them to do what they become passionate about. My youngest son wants to do something medical related, and I think that would be great. This is available and Iâ€™m sure weâ€™d find good roles for them, but I donâ€™t necessarily have that expectation that they are just going to roll right into it. PP: I know you guys do a lot of collaborations. Can you share the story of how one of the collaborations came about? Becky: When we first started, we went around traveling, getting to know some of the wineries. One of the things we were always interested in was collaborating with wineries on small batch brandy. We talked to Doug Fabbioli, a local winemaker just north of here, and he was really enthusiastic, saying he always wanted to distill, but he needed that like a hole in the head. He was just super supportive, and said to let him know if there was anything we needed. Time went on, we were installing the still, ready to test it, but we didnâ€™t have anything to put in it. Scott started to talk about going to buy kegs of beer, and I said, well why donâ€™t we call Doug? So we called Doug, along with a couple of local winemakers around, and Doug happened to pick up the phone. He said, “I have a drum of pear wine, Iâ€™ll bring it over to you.” Â So he brought it over, stayed, we distilled the wine, he liked it, we liked it, and we kind of hashed a collaboration. What he does every year, and Iâ€™m just now finishing it, is he brings us pear wine, especially for distillation, and we distill it, and we split the resulting spirit. He uses that spirit for his pear ports, and we use ours to make a pear brandy, which is our PearousiaÂ®. It’s a lot of fun, we do it all the time, and last year we even did an additional version where we took the used pear brandy barrels and we aged our barrel aged gin in them, and so now we actually get two products from the collaboration. The first one direct, but the second one is indirect. A lot of people enjoy hearing that we do this with Doug, and theyâ€™ll go visit Doug, and taste his products, and vice versa, and its a fun back and forth. It really hatched the seeds for all the other collaborations, from working with Bluemont for the peach to working with Tarara Winery on the grape. A number of other wineries now bring us wine, which will show up in the next few years. Scott: What I like best about that story is that when we were done with that collaboration, at the end of the day, we had distilled off this beautiful pear brandy, and I asked Doug, I said, “Doug, what do we owe you for the wine?” And he says, “Nothing.” He says, “I want to work with you guys for the next 20 years, and so the wine is free,” and I thought, wow, this is great, we are getting into a really awesome industry with some really awesome people and that collaboration is what we enjoy so much. PP: Tell usÂ how you found this new space. Scott: When we started we were in an industrial space that we were renting, a flex warehouse. We outgrew it, so we had been on the market for the proper real estate, and it was hard, we werenâ€™t finding anything. You could find big warehouses in Dulles, near the airport, but nothing out here. We were looking, and one of the town administrators said, â€œI heard this one building is coming up for sale soon.â€ It just had this little sign on the window, it wasnâ€™t very well marked at all, and it was this building. At the time it was was basically like a Hallmark store. It had greeting cards and purses, and things like that. We walked through, and saw the high ceilings, and the brick, and could really see ourselves being here, but your first impression of the building from the outside is it would never nearly be big enough, and so I went back home andÂ told Becky, and she said, no, I donâ€™t think itâ€™s big enough. But I said, just come and see. She was walking through and thought, wow, it really is bigger than you think. To get another opinion we brought our investors over,Â and they said, “This is the building.” The brick, the industrial feel, right on Main Street, it was the perfect fit. We then started the negotiations to buy it, and once we bought it, renovating it was a big job. We put almost as much money into the renovations as we paid for the building itself, but the result is amazing and we are so happy with it. It’s become a wonderful place. Scott: We do events about once a week, if not twice a week now, at least 6-8 events a month, it seems like. They vary. We do a lot of them here, and we do several offsite as well. Of all the different events weâ€™ve done, the dinners are very popular. We do this nice four-course pairing dinner here every month, and those are always wonderful, and well attended, and fun. We get a chance to have dinner with some of our guests, and tell them about the distillery. The bottling continues to be very popular, and we do concerts, and get some pretty amazing artists that come through-Howie Day, Tony Lucca, a lot of pretty famous, independently touring, singer-songwriter types. Itâ€™s a very intimate setting with about 50 people, so thatâ€™s always a lot of fun. We also do private events, like birthday parties, weddings, bar mitzvahs and things, so those are always fun too. One of my favorites though is the oyster event. We collaborate with a local oysterman who lives here in town, his beds are down on the Chesapeake. HeÂ brings in fresh caught oysters and we do pairings with cocktails. Heâ€™ll talk about the oyster, where it was farmed, what the profile of the taste is like, and then we have a cocktail that goes with it. The oysters have different flavors, some are more fruity in taste and some are more briny, and we can can talk about that, and then taste the oysters. Thatâ€™s always super, super fun. PP:Â I know you guys have your own jingle now. What is your favorite jingle, other than your own? PP: What drink are you? Scott: I know what drink my wife is. Scott: Sheâ€™s a Sazerac. Old school, classic, and so sophisticated. Becky: Perfectly balanced-you have to be balanced. Scott: Complex and hard to understand on the first sip. Becky: (laughs) What are you? A beer and a shot? Scott: Iâ€™m probably an Old Fashioned, a fogey my children like to call me, but Iâ€™d like to say Iâ€™m an Old Fashioned, with some exotic mole bitters or something. (Looking at Becky) Donâ€™t snort at me. (Becky snorts). Sheâ€™s going to put in the article, â€œBecky snorts.â€ (Note: yes, the readers need to know where the laughing and snorting occurs).